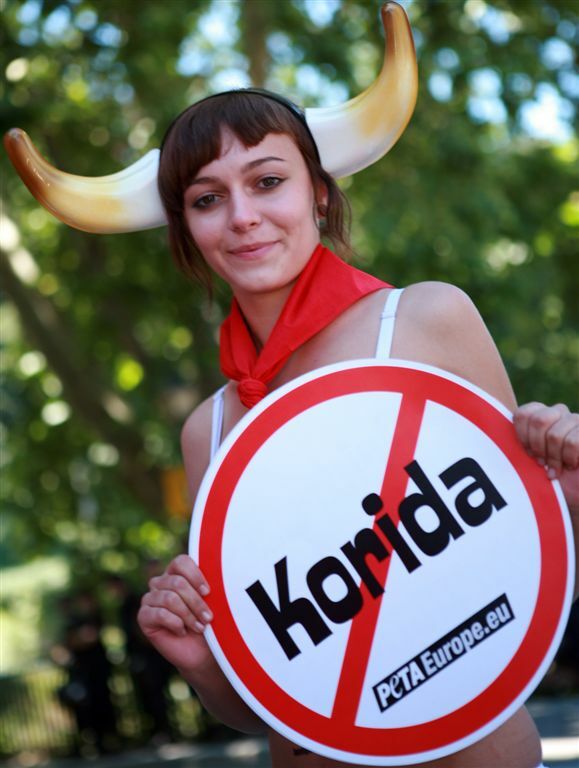 A coach with activists from Zagreb is on July 2 off to Spain to join hundreds of supporters of People for the Ethical Treatment of Animals (PETA) Europe from around the world who will run through the streets of Pamplona – most of them wearing nothing more than red scarves and plastic horns – two days before the city's annual Running of the Bulls, as part of PETA's sixth annual the Running of the Nudes on July 5. 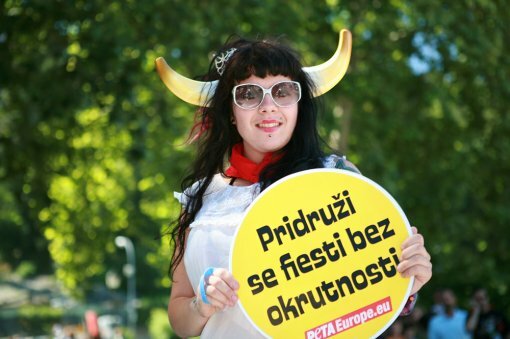 With opposition to the Running of the Bulls and bullfights mounting, PETA is gearing up for its naked run, which has attracted thousands of runners from more than 30 countries. The Running of the Nudes takes the same course as the Running of the Bulls and is a nice opportunity to visit this historic and picturesque city while also helping animals. Prior to the Running of the Bulls, the animals are terrorised with electric prods and sharp sticks and often suffer serious injuries as they slip and fall on the cobbled streets. They are then tortured and slaughtered in the bullfights afterwards, which take place every day during the week-long festival. In bullfights, bulls are often debilitated with tranquillisers or beatings, or have the muscles in their necks cut in order to prevent them from lifting their heads up all the way. "If people are travelling to Pamplona seeking thrills, what could be more exciting than throwing off your clothes and running through the streets with throngs of other people who want the bullfighting and bull run to end?" says PETA Europe Director Poorva Joshipura. "The Running of the Nudes is a win-win-win situation – participants have fun, Pamplona gets tourists and bulls live to see another Spanish sunrise." 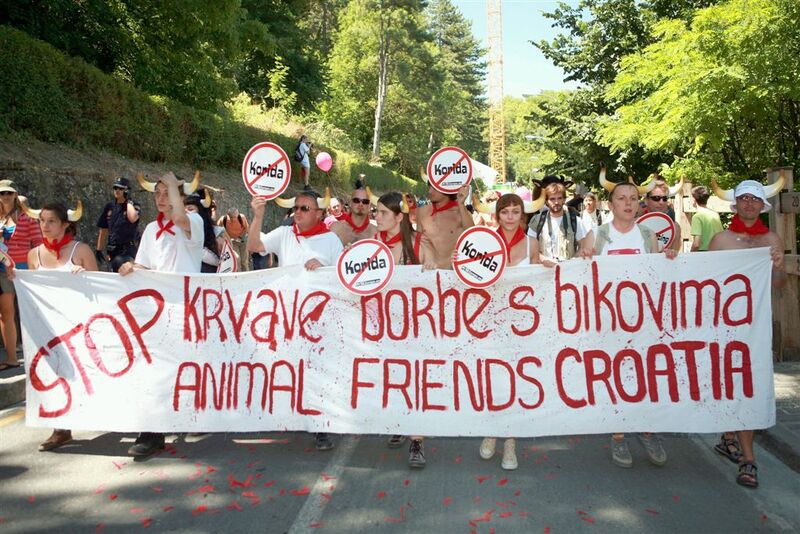 The coach from Zagreb leaves for Pamplona on July 2 at 8 P.M. in front of the Zagreb Railway Station, and some ten activists from Germany and Austria will join the runners from Zagreb, Varazdin, Vukovar, Pozega, Velika Gorica, and Mali Losinj. We use this opportunity once more to invite interested individuals to fill the last free remains seats in the coach! Registration form can be found here.